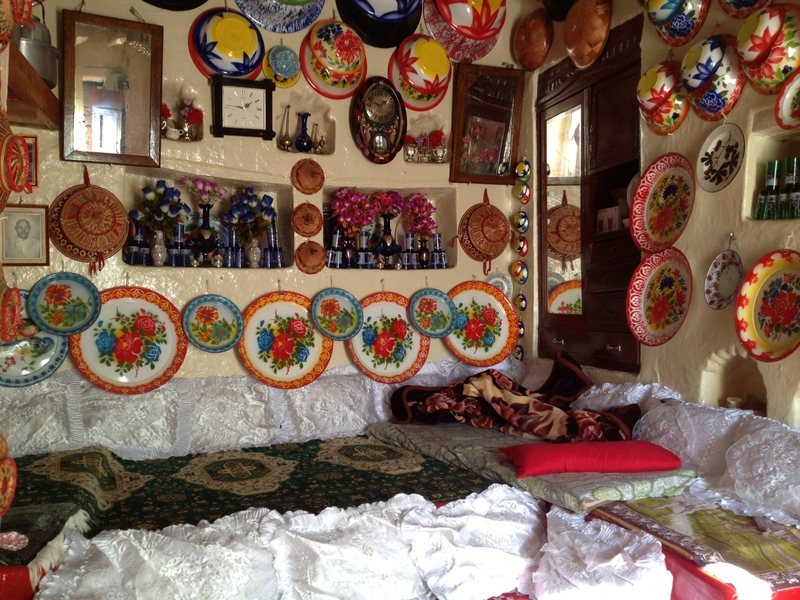 The main room of a traditional Harari house. In part this is just because as soon as I got back to the U.S. I just kind of got swept up in readjusting to life back here – buying a car, seeing people, eating food, and looking for a job. 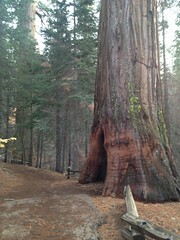 Soon the entire African continent seemed so removed from me, both in terms of distance and time. Cameroon feels so long ago, and my trip to East Africa does too. But if I’m completely honest, part of my reluctance to write this post has also stemmed from my inability to decide exactly what I want to say about my trip to Ethiopia. My first meal (besides breakfast) in Addis Ababa. 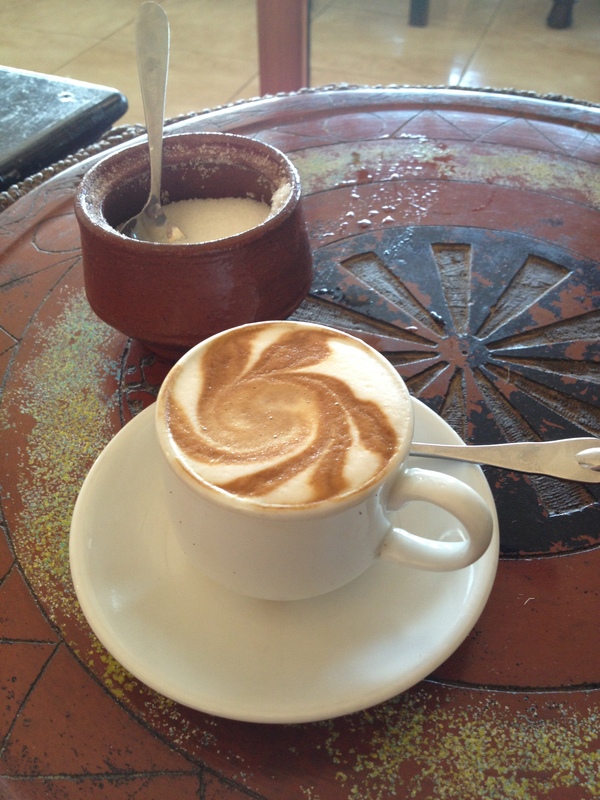 Tasty buna macchiato – coffee with milk. A large part of why I decided to visit Ethiopia was the food. I’d been enamored of Ethiopian food ever since my first taste back in Switzerland. I mean, what’s not to like about having several tasty vegetarian stews all on one plate for you to scoop up with nothing but your hand and some spongy, sour injera? And on that count, Ethiopia did not disappoint. 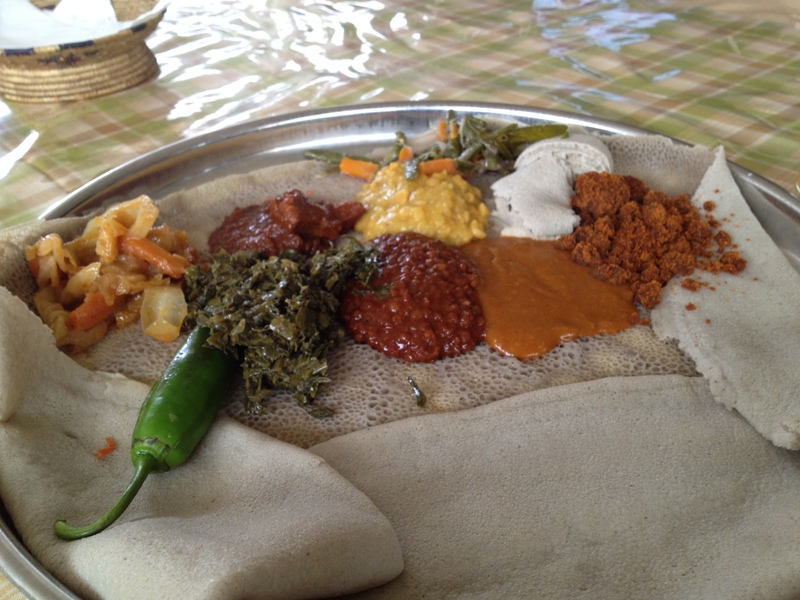 I ate Ethiopian food at least once each day, every day for two weeks and did not get tired of it. 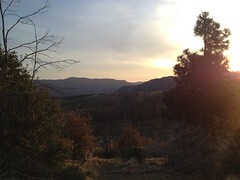 Add in delicious, strong Ethiopian coffee, often for as little as 25-50 cents per cup, and I spent my sojourn in the country constantly buzzed and satisfied. And then there was Ethiopia itself. I’d heard about trips that other Peace Corps Volunteers had taken: Kevin had had a long layover on the way to Kenya and come back talking about what a great city Addis Ababa was, and Laura had gone for a week and come back with fascinating stories about her time in Harar. 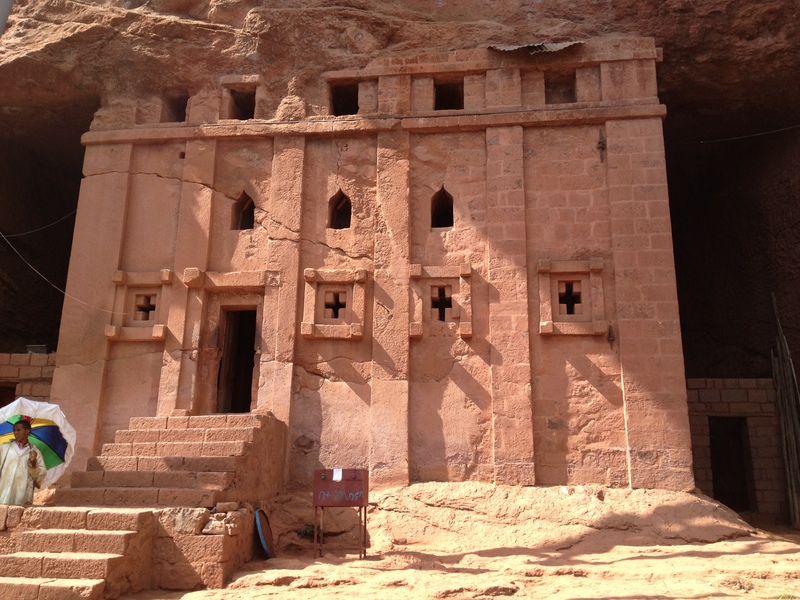 A quick Google search also showed sights like the rock-hewn churches in Lalibela. 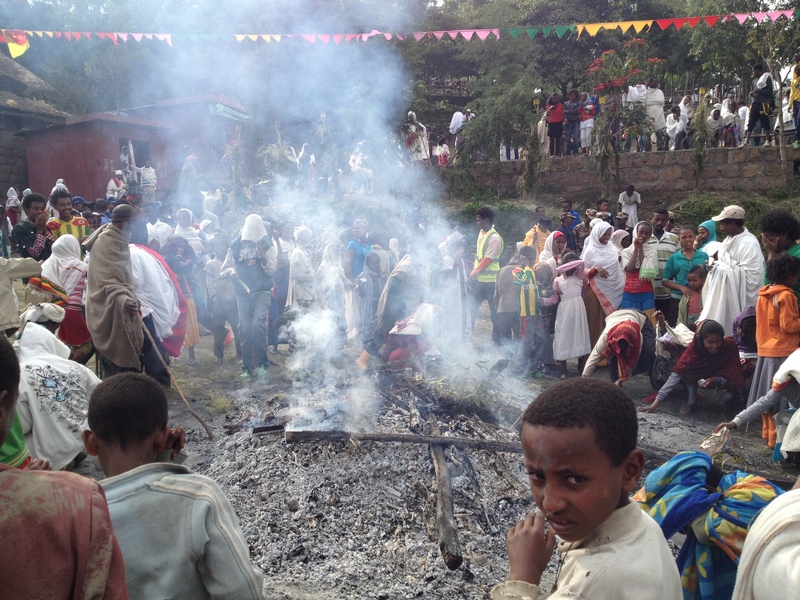 Bete Abba Libanos in Lalibela. So I did go to Ethiopia, in particular, Addis Ababa, Lalibela, and Harar. It turns out that if you have an international flight in or out of Ethiopia on Ethiopian Air and you are willing to wait and book your domestic flights in person at one of their offices, the tickets cost less than half as much as they do online. Lalibela is one of the holiest cities in Ethiopia according to the Ethiopian Orthodox Church. 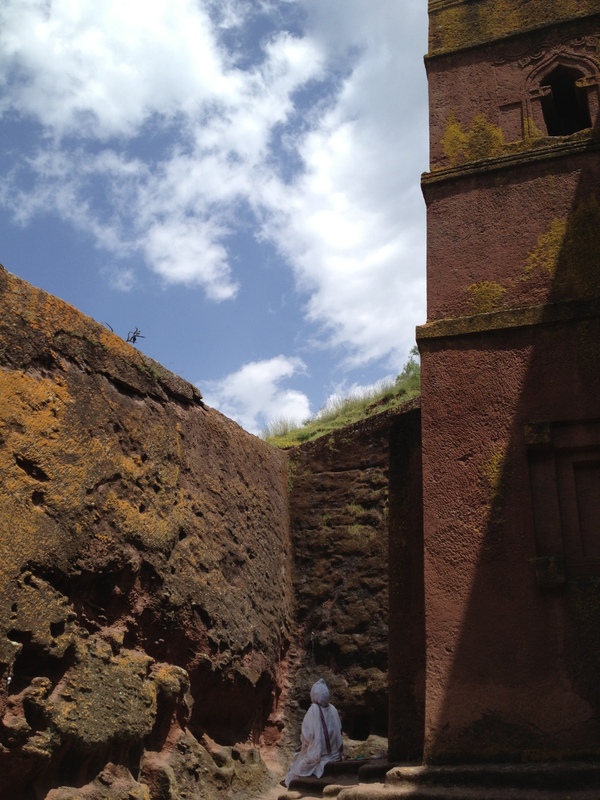 It is the site of 11 churches cut out ofsolid rock during the reign of the Zagwe emperor Lalibela (at the time the town was known as Roha, instead). They were meant to be a replica of Jerusalem in Ethiopia after the real Jerusalem was captured by Muslims in 1187 – there is even a River Jordan in Lalibela, also carved from rock. Seeing all those monolithic carved churches and the pilgrims swaddled in white cotton is an interesting reminder of Christianity’s older roots. 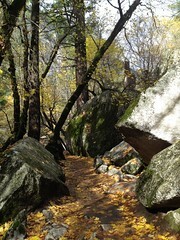 A pilgrim outside of Bete Giyorgis. 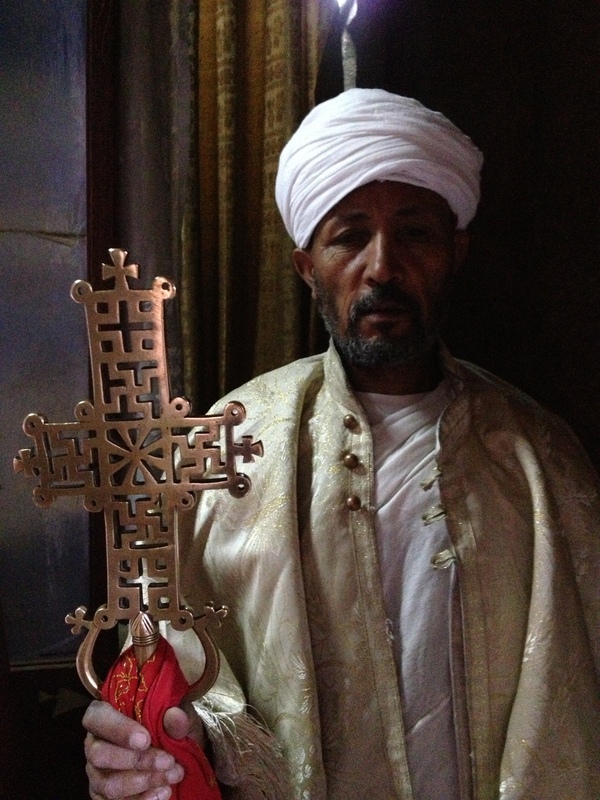 I was in Lalibela during the Ethiopian Orthodox holiday of Meskel (usually September 27th on the Gregorian calendar), which commemorates the finding of the true cross – that is, the one on which Jesus was crucified. This meant that not only were there a lot of pilgrims from surrounding villages in town, but a big celebration on the eve of the holiday with a big bonfire that morning. The aftermath of the main bonfire. Harar, on the other hand, is the most significant Muslim city in the country, and apparently considered by some to be the 4th holiest city in Islam. It’s a walled city on a hilltop with over 80 mosques within the walls of Harar’s old town. 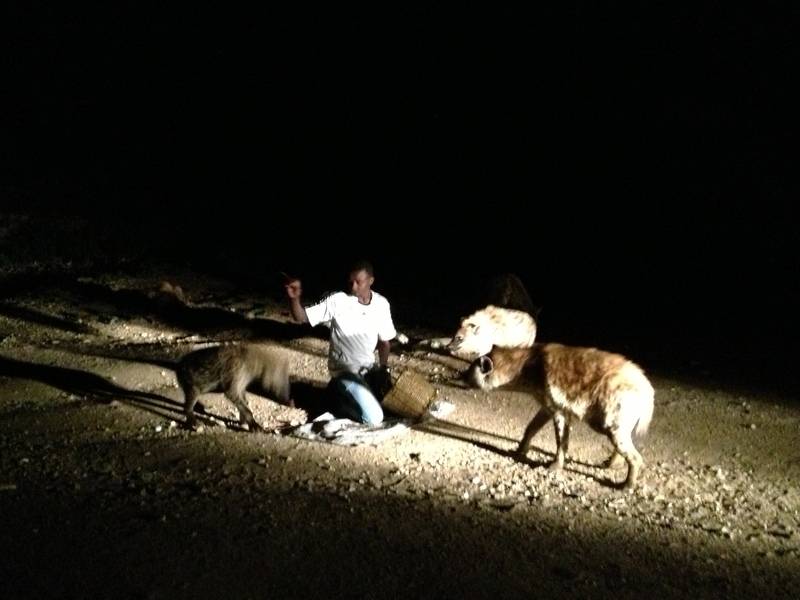 In Harar I saw sights like a man hand-feeding wild hyenas and another sheep being sacrificed for Tabaski (see also: Le Fête de Mouton), though I completely failed at finding the main celebration for the holiday. I have to admit, though, that despite all that I saw in Lalibela and Harar, Addis Ababa was my favorite of the places that I visited in Ethiopia. Addis doesn’t have the magnificent monolithic churches of Lalibela, nor does it have the narrow winding alleys of Harar’s walled city, and the price of its taxis gave me a renewed appreciation of Yaoundé’s taxi system. But having just spent those two years in Cameroon, I could definitely appreciate Addis Ababa’s amenities. The inexpensive day spas, the froyo place complete with free wifi, the food, and oh my goodness, the food, both Ethiopian and otherwise. It’s an African metropolis that is modernizing very quickly. But the other thing that really set Addis Ababa apart from both Lalibela and Harar was my experience just walking down the street. You see, a white woman in a country like Cameroon or Ethiopia is bound to stand out a bit. And how people respond when they see a white woman varies from person to person and place to place. In Cameroon, the East, West, Center, and South regions were ones where non-black Peace Corps Volunteers in particular expect more harassment than in the Grand North or anglophone regions. 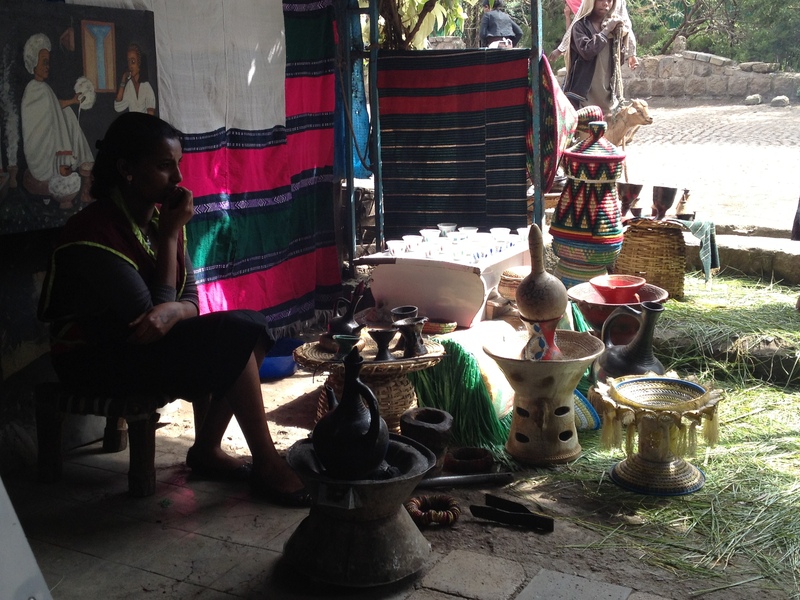 In Addis Ababa, I was actually surprised by how little harassment I experienced. In Lalibela and Harar, however, harassment was an almost constant part of the experience. To be fair, the vast majority of people yelling at me seemed to be going in the direction of wanting to be my guide, and as far as stereotyping based on appearance goes, “rich tourist” is pretty positive and certainly not completely untrue. But when people are yelling at you constantly, and you don’t know which ones are going to go from “you need guide?” one second, to an offer to “help” me by marrying me, or occasionally much worse, the next second, it gets exhausting very quickly. The Peace Corps Volunteers I met in Addis told me that sometimes the harassment even goes as far as people throwing rocks, but fortunately this wasn’t something I encountered. I am glad that I went to Ethiopia, but I’ll also admit that by the time I was boarding a plane to leave the country, I was very ready to be going home. All set to brew some Ethiopian coffee.